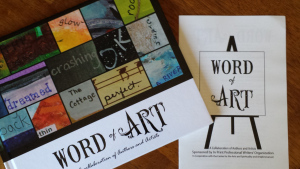 When I was writing up the proposal for Word of Art, I kept it strikingly similar to Drawn with Words, the Art in your Eye program I had participated in the year before. Same word count, same provision of 16×20 canvas, same book format. But there was one major difference. I wanted to hold a reception where the authors and artists met and mingled and were able, if wanting, to sign each other’s books. This past Friday, my dream came to fruition. Centerpieces provided by Kristin Oakley, photo by Sharon P. Lynn, cupcakes by Christina Lamphere. 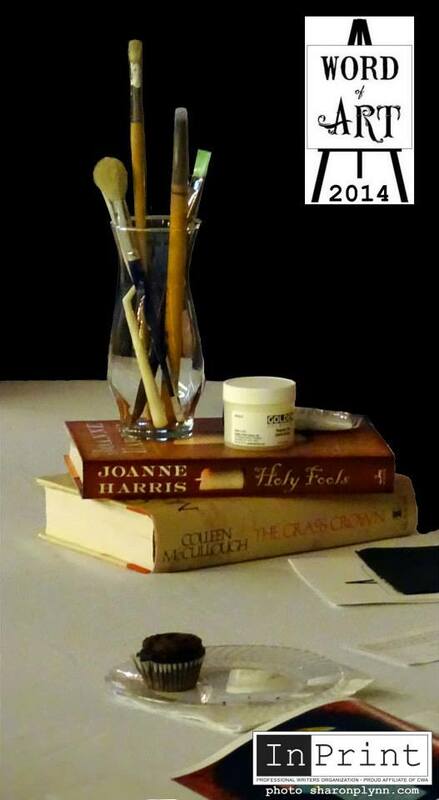 The Word of Art Exhibition and Book Release Reception was held September 5, 2014 at Emmanuel Lutheran Church, and it was fantabulous*. The book is pretty cool, too.